Welcome to the Housing Information website, a project of Consumer Action. The Housing Information site is designed to help you make intelligent and cost-effective home-buying decisions by providing fact-based and unbiased information and tips. April 22, 2019 Why aren’t more people tapping into their home equity? 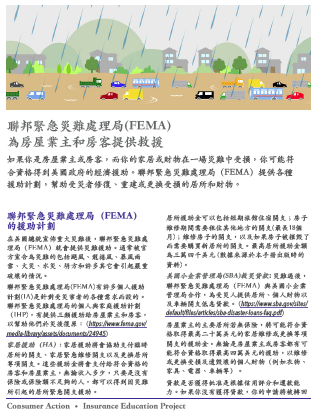 FEMA spells federal disaster relief for homeowners and renters (Chinese). 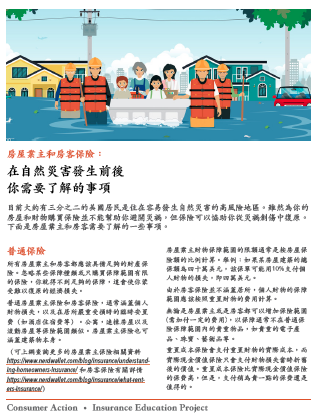 Homeowners and renters insurance (Chinese) What you need to know before and after a natural disaster. Homeowners and renters insurance What you need to know before and after a natural disaster. 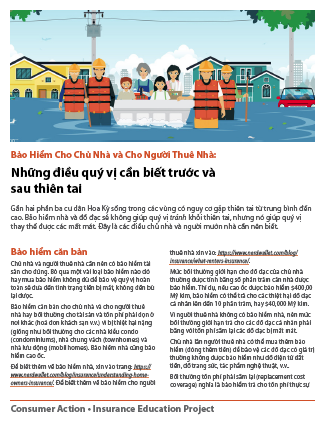 Homeowners and renters insurance (Vietnamese) What you need to know before and after a natural disaster. Đại đa số cư dân ở Hoa Kỳ sống trong nguy cơ gặp thiên tai, hầu như các gia đình cần nên chú trọng đến cách họ sẽ khôi phục lại các mất mát về nhà ở và tài sản của họ. Ấn bản này giải thích các mất mát nào do thiên tai được và không được hãng bảo hiểm bồi thường, dựa theo hợp đồng bảo hiểm thông thường của chủ nhà và người thuê nhà đã mua, để có bảo hiểm đúng mức, các bước cần làm để khôi phục lại các mất mát sau thiên tai, và các lựa chọn khác nếu hãng bảo hiểm không bồi thường hết cho quý vị. 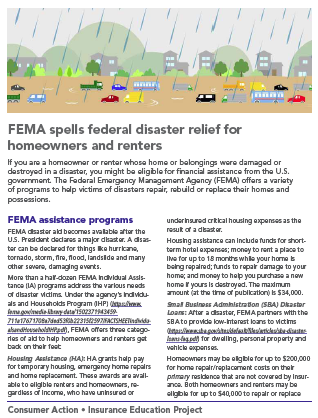 FEMA spells federal disaster relief for homeowners and renters. In-language tools for homebuyers and borrowers. Language barriers have landed some limited English speaking consumers with mortgages they didn’t understand and couldn't afford. Now there are some new and improved tools designed to help LEP borrowers buy and keep a home. Obtaining mortgage relief for victims of disasters. 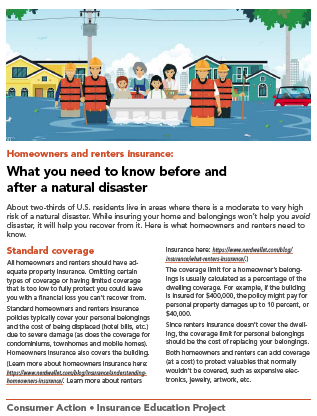 The National Consumer Law Center's (NCLC) updated and comprehensive guide explains what relief is available to victims of natural disasters, including insurance. NCLC also covers what rules apply to help homeowners save their homes from foreclosure. Resources for those facing foreclosure after a natural disaster. The Consumer Financial Protection Bureau (CFPB) has compiled a list of resources for those who are facing foreclosure after a hurricane, wildfire or other natural disaster. It lays out steps to take to if you can't pay your mortgage with links to those who can help. Information is available in Spanish and English. #FHAct50 honors the Fair Housing Act. The National Fair Housing Alliance (NFHA) has launched a campaign to commemorate the 50th anniversary of the Fair Housing Act. #FHAct50 is designed to educate the American public about the importance of the Fair Housing Act and advocate for strengthened fair housing policies nationwide. Wall Street landlords turn American dream into a nightmare. A new report exposes the harmful impacts Wall Street landlords are having on the growing single family rental market. Wall Street landlords are fundamentally changing homeownership in the U.S. with massive purchases of single-family homes, squeezing out tenants and prospective homeowners, particularly in communities of color, according to a report by Alliance of Californians for Community Empowerment (ACCE), Americans for Financial Reform (AFR) and Public Advocates.